The idea that deeper understanding helps informed citizens make better decisions is what one health promotion specialist is hoping to spread far and wide. Matt Vogel used this premises when addressing students Tuesday about drugs and alcohol. Vogel explained that many drug education programs, especially Nancy Reagan’s “Just Say No” campaign in the mid-1980s, focused on drug deterrence, which oversimplified a complex problem. Vogel’s approach to drug education is slightly differently– he wants students to Just Say Know. Whether students are thinking of trying drugs, are habitual users or have gotten sober, Vogel said it is important for them to think critically about drug use and how it can intersect with other things in one’s life. 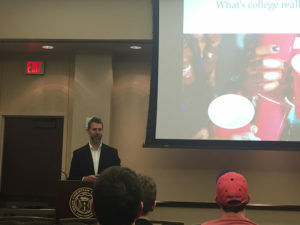 Vogel discussed topics ranging from the impact drugs and alcohol can have on the body, to the historical presence and perception of drugs in the United States and even rising trends in overdose deaths due to opioids in the past five years. No matter the drug, the frequency of usage or the dosage, Vogel stressed an important factor that relates to substance use: motivation. Vogel also emphasized the importance of knowing oneself. Regarding marijuana, Vogel said trends indicate more states will be legalizing the drug and that drug reform policy would be beneficial at a federal level. “Instead of saying ‘don’t take drugs’, we have to be willing to explore drug use as these laws change,” Vogel said. Caroline Albritton, program specialist for Alcohol and Drug Education, one of the sponsors of the event, leads a peer support group for students in recovery and spoke about the importance of having open dialogues about drug use on campus. Albritton described her office’s approach to drug usage and recovery as harm reduction. Above all, the night’s message revolved around safety. Vogel said students will make better decisions when they’re feeling good and healthy. “You have a choice and autonomy in what you do in life and I encourage you to think of how you can be empowered,” Vogel said.